Now available to download in pdf format. Get the whole book here (164MB file) or download individual chapters from the table of contents below. • critical reader responses from key figures in the field, working in Japan and overseas. Note: author email addresses in the pdf files may be out of date – please use the addressses in the table of contents below to contact authors. Reviews of Autonomy You Ask! 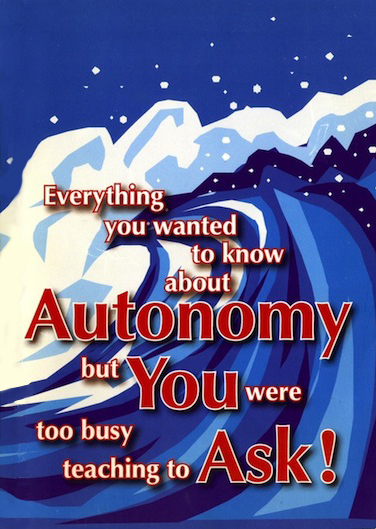 “One value of Autonomy You Ask! overall is the way we’re given rare insights into the process of developing autonomy – snapshots of a never-ending journey, not pronouncements set in stone.” Richard Smith, University of Warwick, UK. “the book itself is a piece of interactive discourse which constitutes successful action research in teacher/learner development. It is also original in articulating the pedagogical debate in a socio-cultural framework and in providing an account of the development of autonomy for learners and teachers of English in Japan. In a fundamental sense, the form of the book cannot be separated from the content which is based on a dialogic notion of knowledge-construction across cultures.” Edith Esch, University of Cambridge, System 33 (2005).